It’s very rare for an NFL quarterback to complete a pass in which the intended receiver is standing more than 45 yards from the line of scrimmage. In fact, NFL quarterbacks only attempted 175 such throws during the entire regular season last year, and only 48 resulted in completions. Joe Flacco was responsible for six of them. Until recently, this kind of factoid was hard to uncover, but like every other sport, football’s analytics are evolving quickly. Thanks to new forms of data and emerging kinds of analyses, teams, media, and fans are gaining new insights into on-field performances. I have been exploring one such data set, a giant collection of highly detailed passing data created and maintained by ESPN’s Stats & Information group. 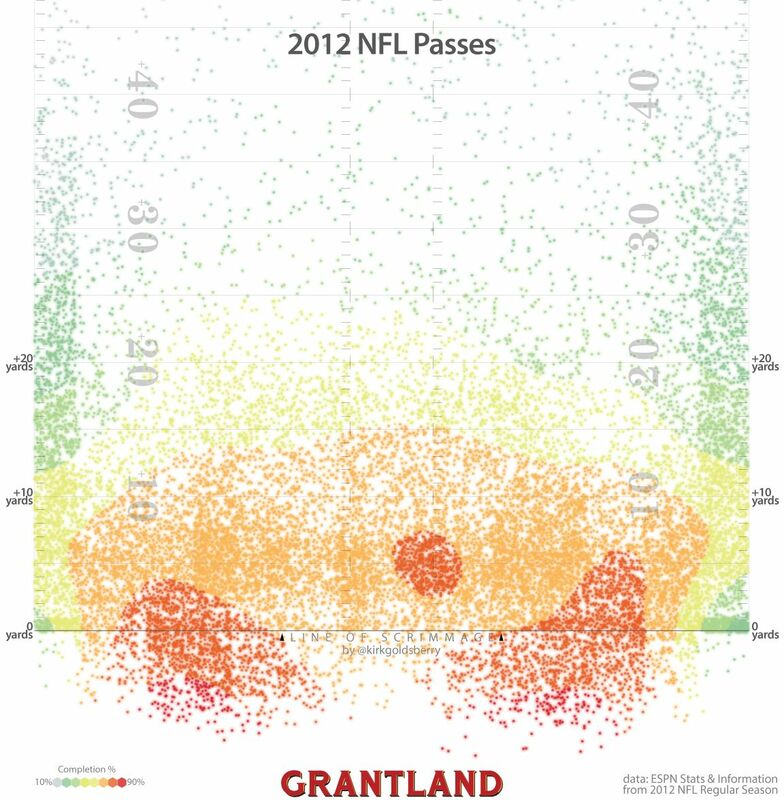 During the 2012 regular season, NFL quarterbacks attempted more than 19,000 passes and completed more than 11,500; the chart above shows the location of nearly every pass. Dots are placed in spots nearby the receiver or the intended receiver. In the cases of out-of-bounds throwaways, those dots are placed at the sideline near where the ball went out of bounds. The color of the dot corresponds to the league’s overall completion percentage in that zone. 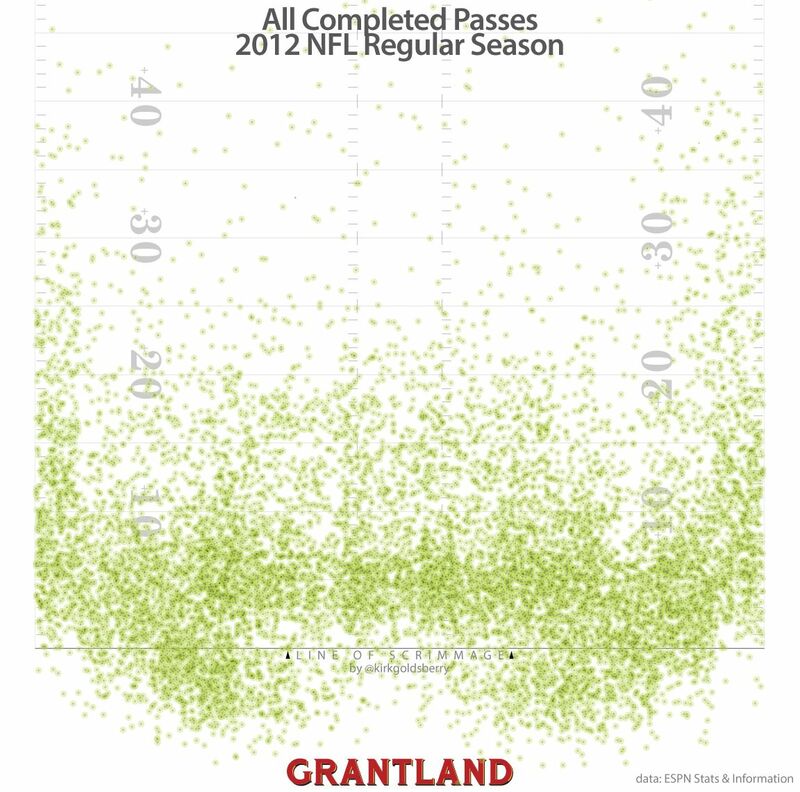 If we look only at completed passes, we see similar patterns. Long “bomb” completions are rare and a vast majority of NFL completions occur within 10 yards of the line of scrimmage. In fact, only about 31 percent of all passes are thrown beyond 10 yards of the line of scrimmage. We hear a lot that the NFL is a passing league, but it’s more accurate to say that it’s a short-passing league. The chart also immediately reveals the importance of the sideline, particularly downfield. Of passes thrown more than 20 yards, 69 percent are directed between the numbers and the sideline, while only 9 percent target the area between the hashes. Although it’s fun to look at thousands of dots, it’s not really that informative. 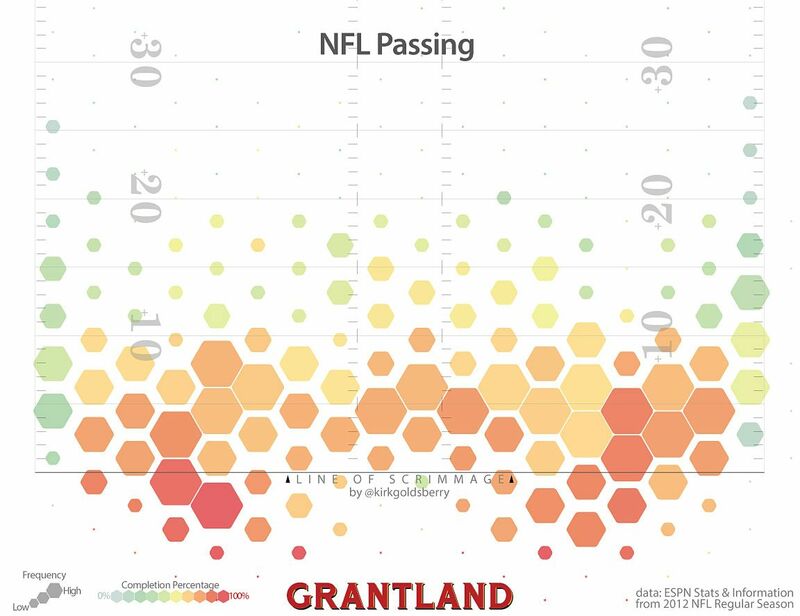 The chart below aggregates the 19,000-plus pass attempts into hexagonal zones, reinforcing the idea that short passes are king and revealing the league’s most common passing targets. Although at first glance the pattern may appear mostly symmetric, NFL quarterbacks target receivers on the right side (46 percent) of the field more than the left side (41 percent). More than 68 percent of the league’s passes are short throws that target receivers either behind the line of scrimmage or within 10 yards of it. Some may find it surprising that many of the league’s passes target players behind the line of scrimmage. But screen passes and checkdowns are relatively common. Regardless, the most common throws by far are those short positive-yardage attempts. Remember, the sideline data here are “polluted” by those out-of-bounds throwaways that count as incompletions. As a result, the completion percentages near the edges of the field might be lower than you expect. It turns out the sideline is very important to the NFL quarterback, both for targeting receivers and for getting rid of the football. 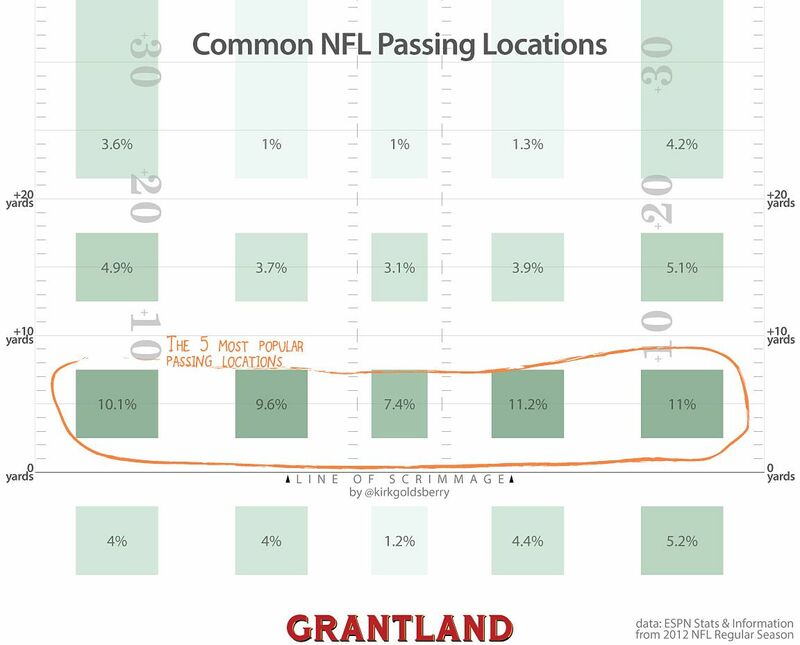 In terms of efficiency, although the league’s quarterbacks as a whole completes about 60 percent of their passes, completion percentage depends heavily on location. Obviously, long passes are less likely to be completed than short ones, but the effect is striking. Here you can see the average short pass is much more likely to be completed than the average long one. Different teams and quarterbacks use the field in different ways. For example, the aforementioned Joltin’ Joe Flacco threw 17 percent of his passes beyond 20 yards, while the league at large threw only 11 percent of its passes that far. 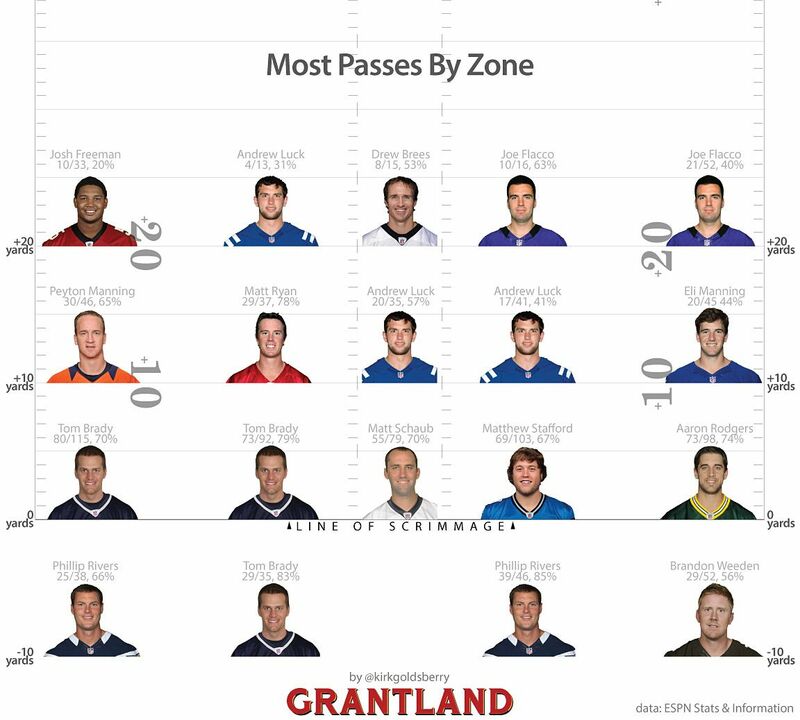 This graphic reveals which quarterbacks target which areas the most. Unsurprisingly, Flacco is the mayor of both areas to the right of the hash marks beyond 20 yards out. You can see that Tom Brady and Andrew Luck each appear three times. Last season, Brady loved peppering the left side of the field with short passes, but it remains to be seen whether he can be as successful doing that without Wes Welker and Aaron Hernandez. 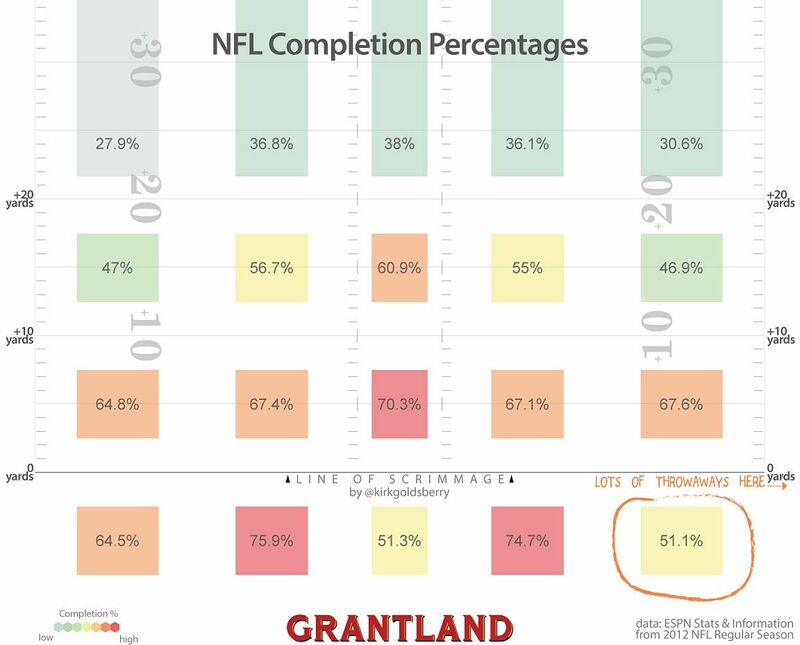 Luck, on the other hand, loves the longer throws even though his success rate in these areas is below league average. As the NFL enters its own version of the big data era, we should expect to understand the game better. New data and emerging forms of analytics can only stand to improve the characterization of NFL performance. Unfortunately, it’s fair to say that of the major American sports, the NFL is the least analytical, but it appears things are about to change. Happy NFL season, everybody! Is Old Dominion's Taylor Heinicke the Best Quarterback in Virginia?